Datura’s spectacular trumpet flower, little woodland behind, 2001. This was a ‘patio plant’ from the old Woolworth’s at the Angel, labelled ‘Datura’. It was a bare-rooted stick in a pot, but the photo of its trumpet flower made me believe it would be beautiful on the balcony of my previous flat.. Surely bees visiting the Nasturtiums would enjoy its trumpet flowers. It grew to quite a size, with buds like small cigars and each leaf the size of a marrow. Its elegant, PINK-tinged flowers were spectacular, but they brought no bees. At night the trumpets gave out a sweet, strong perfume, but I saw no moths. 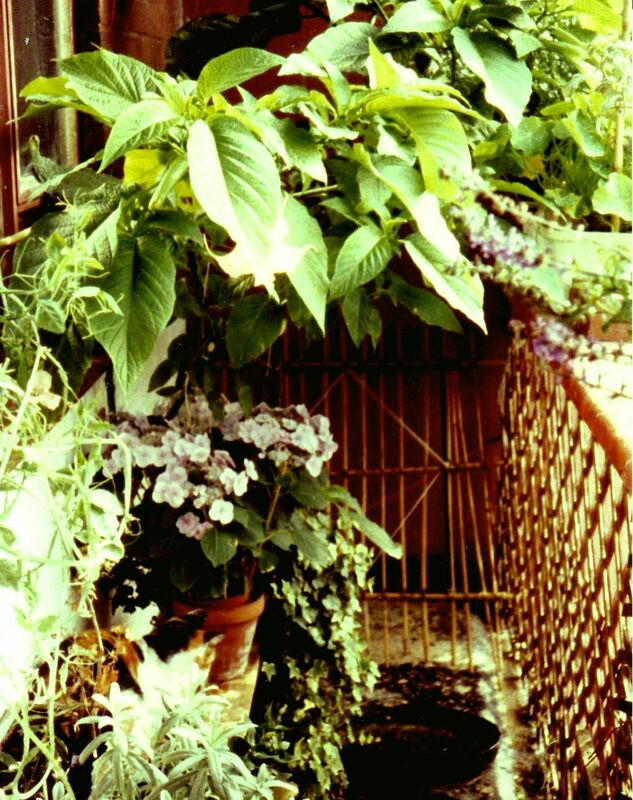 For five years the Datura lived on the balcony, with sparrows perching on its thick stems. Left to its own devices, it wanted to grow to about five feet in diameter. It was cut down before each winter &, on nights when frost was forecast, covered with bubble wrap. 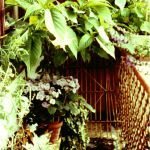 It came to Highbury in springtime 2001 in its very large container, & spent summer in the garden. As winter approached, it was covered with bubble wrap – but did not survive. 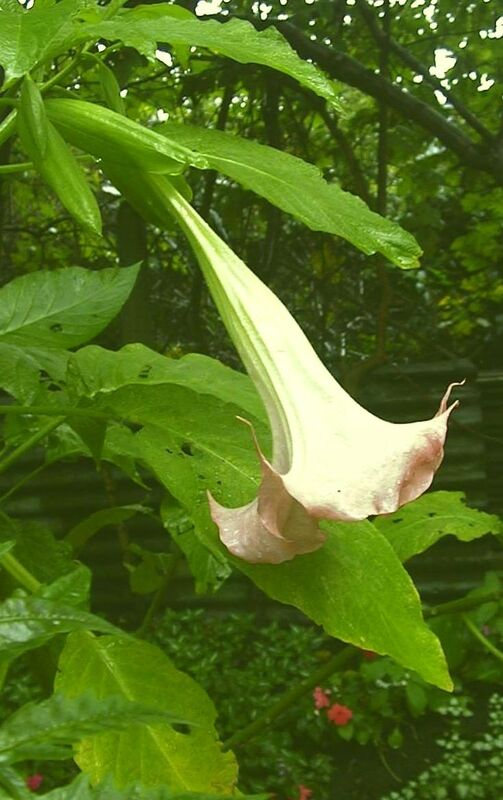 I’ve since seen two sizable Angel’s Trumpets grown in the ground in North London front gardens, with YELLOW trumpets visited by many bees… Perhaps they had mild winters in which to get their roots down when first planted out, & their placement in relation to neighbours’ shrubs, rising sun, etc. gives them a windbreak & a sheltered position. 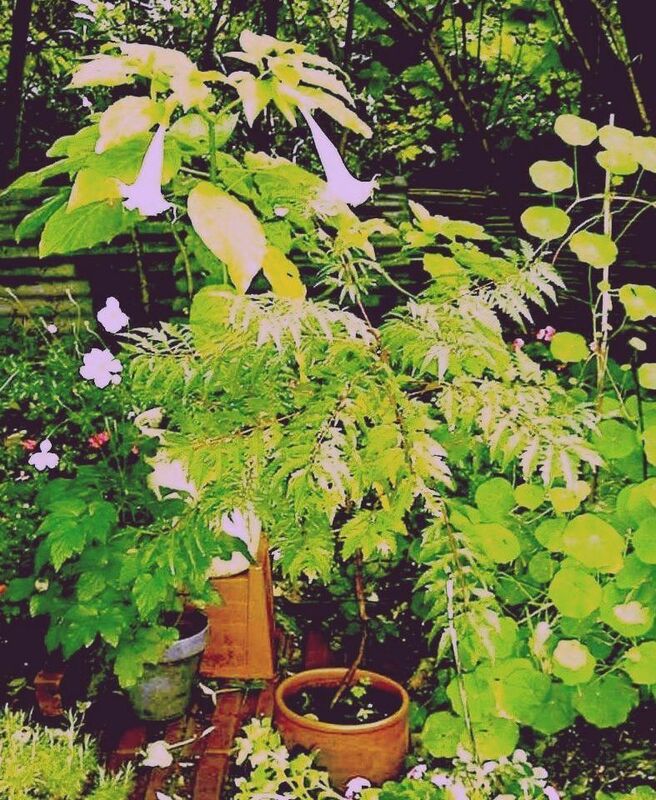 Known as ‘Datura’ when I bought it, this plant has since been reclassified as ‘Brugmansia’ with six other species : all have large trumpets opening downwards. Nine smaller species with trumpets opening upwards are now ‘Datura’. Every part of the Angel’s Trumpet is toxic, with confusion, delirium & hallucinations the most common symptoms. “Nor had I ever been sufficiently grateful for not living in an island where the local burglar blows the pollen of datura in through your open window by means of a blowpipe and helps himself to your possessions while you lie temporarily insensible’. A New Anthology by Robin Lane Fox, Michael Joseph, London, 1986.